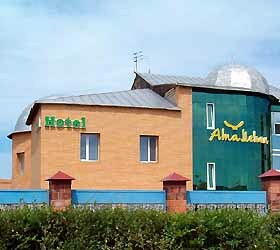 Small and cozy "Atameken Hotel" is situated in a villa community on the outskirts of Pavlodar. The city centre can be reached within 15 minutes, a taxi ride to the railway station takes 20 minutes, and a similar trip to the airport will set one back for 40 minutes. Hotel guests enjoy a delightful relief from noise and fuss of the big city, staying in comfortable rooms that come fitted with Sat-TV, telephone, fridge, and bathroom with shower. The moderate key count of 8 allows professional hotel staff to approach the needs of each client with utmost attention. At the hotel, guests can dine at the cozy cafe, play billiards and recover after a busy day or stressful business meeting at the sauna. Driving guests can park their vehicles at the adjoining parking lot.